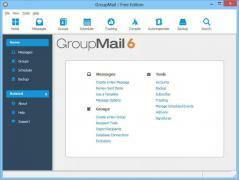 GroupMail Lite Edition is an powerful email marketing application that allows you to send messages to unlimited people or groups. The interface is simplistic and user-friendly and lets you send emails with just a few clicks. Another great feature is that it allows you to create custom groups easily and lets you send, delete, add/remove contacts or manage emails sent to these groups with ease. The software also lets you automate website subscriptions, opt-outs and bounce messages. Evidently, since you can create groups, you can add or remove contacts as well as importing any additional contacts, if needed. GroupMail Lite Edition features a wide array of HTML templates that make sure your emails look professional and are compatible with all major browsers and email clients. The application also lets you schedule your marketing campaign as well as test any emails before sending them to multiple contacts. All-in-all, if you own a business or manage different sites, GroupMail Lite Edition is one of the best marketing tools you can use, it features a lot of features, it's extremely easy to use to use and it simplifies your marketing strategy. Easily encrypt or decrypt your email messages.